Life as the sole sale item in the clearance corner of Eben's Bikes can get lonely. 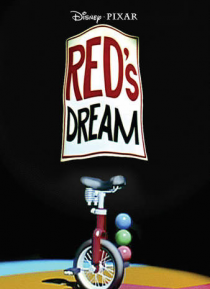 So Red, a unicycle, dreams up a clown owner and his own juggling act that steals the show. But all too soon, the applause turns into the sound of rainfall, as reality rushes back. Red must resign himself to sitting in the corner and await his fate.